In 1537, Thomas Cromwell had it all going for him. From his humble beginnings, he was now Lord Privy Seal, one of the highest ranking government officials under Henry VIII. High in favour with the King due to his success in obtaining the King’s divorce from Catherine of Aragon, engineering the split from Rome, and the lucrative suppression of the monasteries, he had been raised to the peerage, and in August 1537, he was made a Knight of the Most Honourable Order of the Garter, the highest honour possible. This photograph is of a page in the Liber Niger, or Black Book of the Order of the Garter [SGC G.1]. 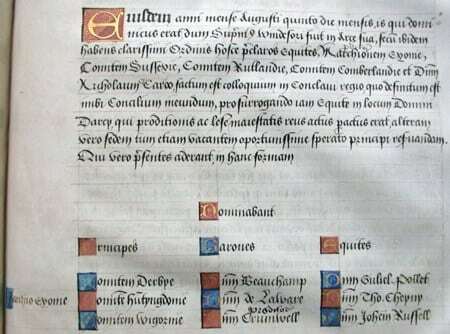 Written in Latin, it contains a record of all nominations and elections to the Order, and this page shows that on 5th August 1537, Thomas Cromwell was nominated and elected to the Order. He was installed a few weeks later on the 26th August. Above his name, however, is written the Latin word “proditor”. This translates as traitor, and appears against every entry of Thomas Cromwell’s name. Cromwell was a keen Reformer, and following the beheading of Anne Boleyn, he recommended Anne of Cleves as Henry’s next wife, hoping that the marriage would breathe fresh life into the Reformation in England. The marriage was a disaster and Cromwell bore the brunt of this failure. He was subjected to a Bill of Attainder, convicted of treason and executed on 28th July 1540. When a Knight of the Garter was convicted of treason, he was ejected from the Order in a process known as degradation. His Garter, Collar and regalia would be taken off him, and a warrant would be issued ordering the removal of his achievements, the banner, helm and crest in St George’s Chapel. These would be thrown down into the quire, whereupon the Officers of Arms would kick the achievements out of the quire, through the Chapel, out the door, across the Lower Ward and into the Castle ditch as a demonstration of the unworthiness of the degraded knight. The stall plate would then be removed and often destroyed. This would have happened on the degradation of Thomas Cromwell in 1540. Earlier that year, it had been debated in Chapter that any reference to a degraded knight should be erased from the register. Instead the King had ordered that the register should remain untouched, but that “Vah proditor” [Fie on you, traitor] should be written against the entries. Thomas Cromwell would be the first to be punished in this way.